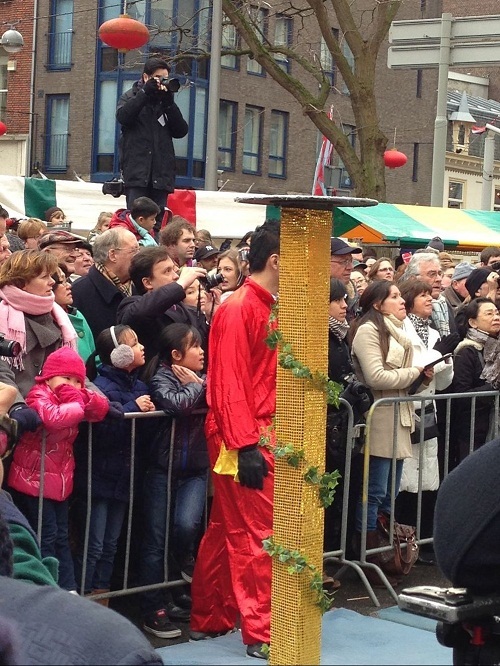 This past Saturday was the celebrations for Chinese New Year in The Hague. I took some photos of the “statues” that represent the holiday. Upon closer inspection, I noticed these are mostly the same statues used back in 2013 for the first Chinese New Year I attended (scroll down to the second-to-last photo). with the Oude Kerk (Old Church) in the background, and a bird flying past too! For some of them it was actually a bit hard to tell which of the 12 animals they represent, but because a few stripes on the top of this guy’s head (above), I think he might represent the year of the tiger. 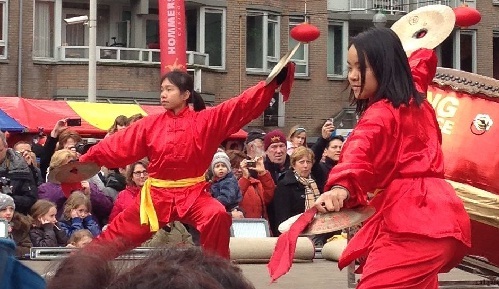 The Hague will again feature Chinese New Year celebrations this Saturday to mark the occasion – see the scheduled program. 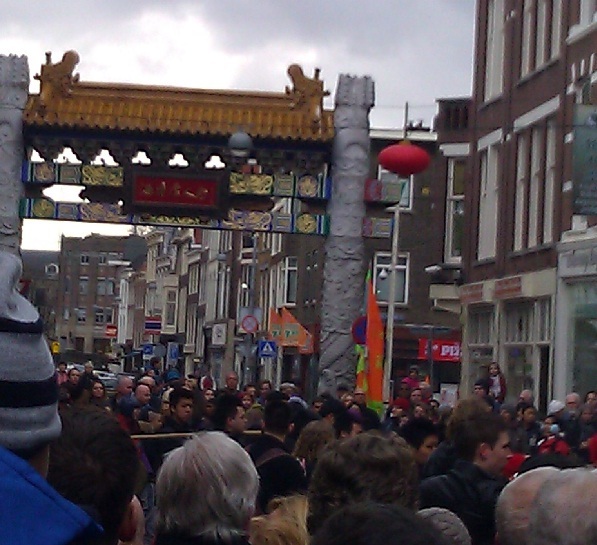 The holiday is celebrated nationally in city hall while the local celebrations are held in Chinatown, including Rabbijn Maarsenplein and Bijenkorf’s parking lot. 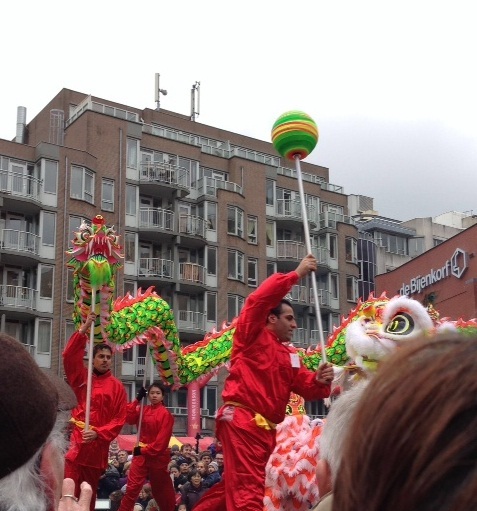 I’ve always been a big fan of the local celebrations held at Rabbijn Maarsenplein (with its Chinese New Year market) and the area behind Bijenkorf (which always has lovely sculptures). But the dance routines in city hall are not to be missed, either! Come check it out. You won’t regret it! 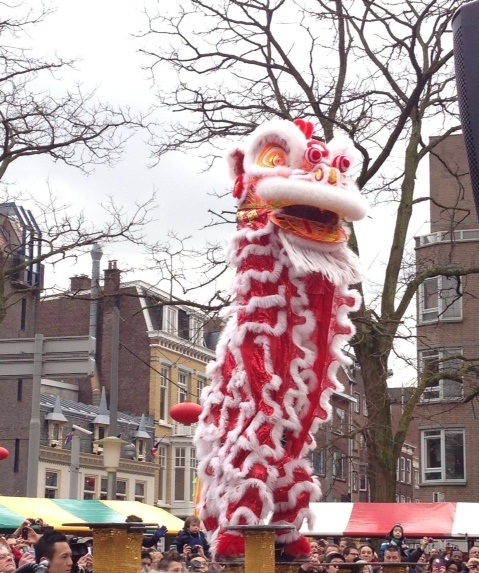 Tomorrow the city of The Hague and the Embassy of the People’s Republic of China in the Netherlands will be hosting the Chinese New Year celebrations. 2017 is the year of the rooster! 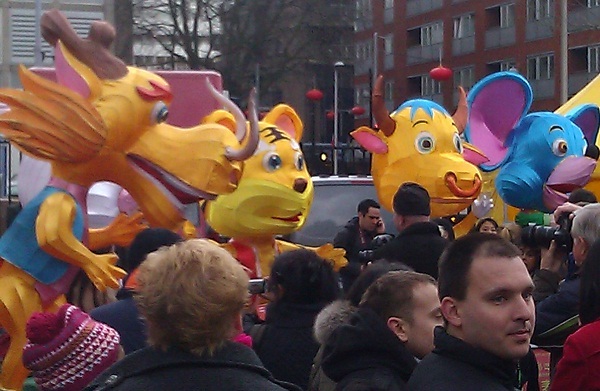 Marco, his mother and I traveled to the city center of The Hague today for the Chinese New Year celebrations. 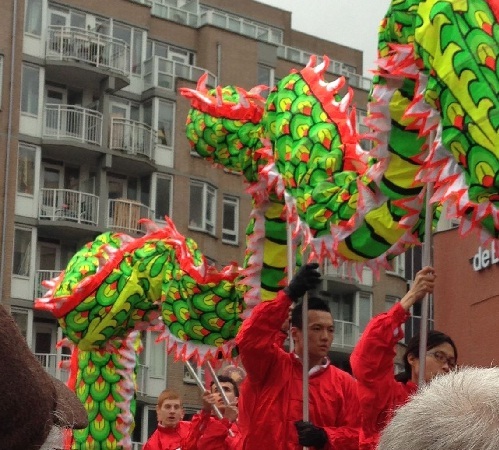 This included a few different parades, dragon dancing, a speech from the vice-mayor of The Hague, and more. The main action occurred just outside of de Bijenkorf (a department store) near Gedempte Gracht (street) in a parking lot (Google Maps). 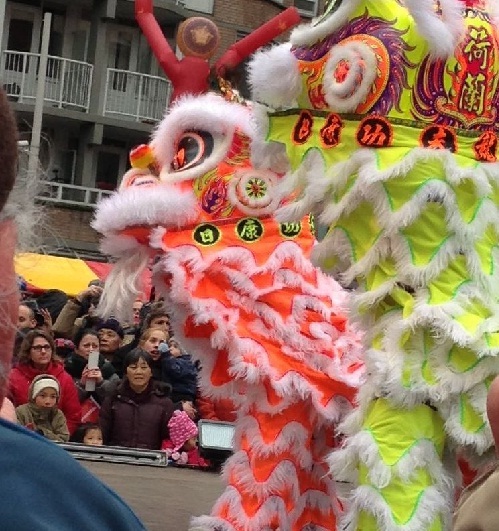 The opening of the ceremony began with the waking of the two dragons using drums. 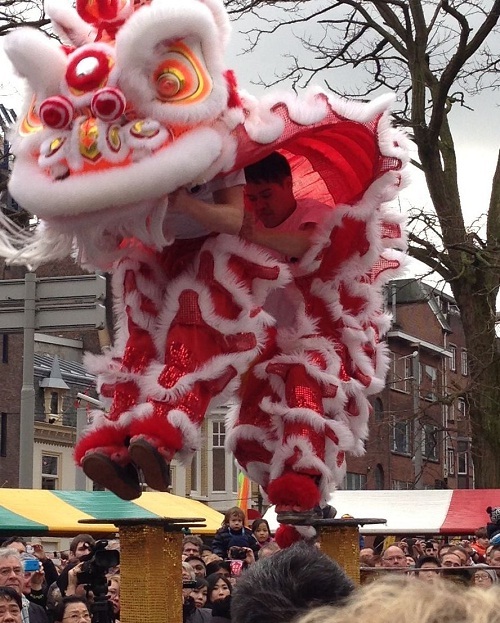 The movement of the dragon was simulated by pulling the steel rods up and down – one person up, the next person down. I just liked the look of concentration on his face. The guy in orange has the job of catching the performers if they fall. They did twice – once in the beginning and once in the middle, on the highest pedestal. But no harm came – they were always caught before falling to the ground. 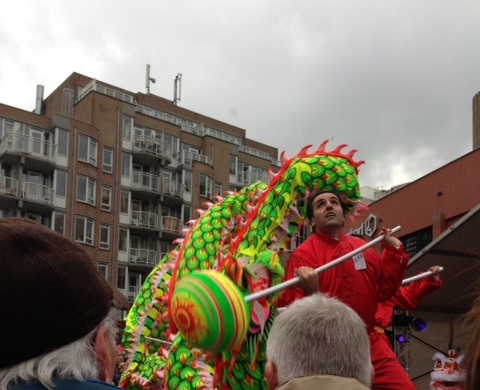 One performer on the other performer’s shoulders, to give the illusion that the dragon was rearing up. catching them in the act of jumping from one pedestal to the next. Afterwards, they unveiled the “statue” for each of the years. This is the year of the snake. A crowd forms near the beginning of the parade that came later. It was pretty fun, but very cold, considering!